Energy in wind comes from the uneven solar heating of the atmosphere. The use of wind for energy goes back to the earliest sailing ships. 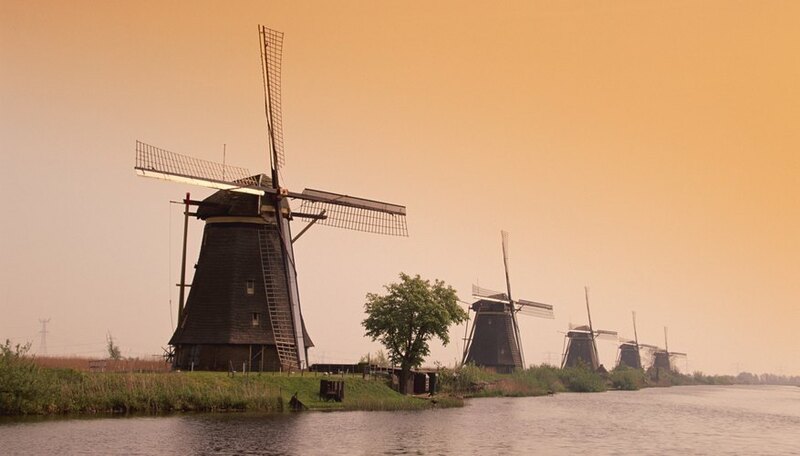 On land, windmills applied the principle of sails to a rotary shaft, to harvest the mechanical energy of wind for providing mechanical power. Small windmills on farms power water pumps, and some were coupled to automobile generators to generate electricity on the farm before the electrical distribution grid was built. Now huge wind turbines provide power for that grid. The basic components of a modern wind turbine include the rotor blades mounted to a low-speed shaft, and a gearbox connecting the low-speed shaft to a high-speed shaft, which turns a generator. A brake protects the system from excessive speed in winds over 88 kilometers per hour (55 miles per hour). There is no actual turbine. The system stands on a tall tower with a "yaw drive" to control the direction the turbine will face, as described by the Department of Energy. An anemometer measures wind speed, and a controller starts or stops the system, according to the measured wind speed. The size of wind turbines varies with the application, ranging from single homes to utility-scale turbines arrayed in wind farms. The Wind Energy Foundation explains how the generating capacity varies with the square footage of area swept by the rotors, by wind speeds and even by the density of the air due to variations in temperature and altitude. The energy available in wind increases by the cube of the speed -- that is, a twofold increase in wind speed yields eight times the power. The most precise measure of a turbine's capacity in a given site is the "specific yield" produced by the turbine in a year. Selecting and designing a wind farm requires many steps and considerations, as described by the World Wind Energy Association. First come legal issues like permitting and then site issues like the amount of wind and the quality of the ground to support the turbine towers and physical proximity to existing power grids. Land must be leased, and contracts secured to sell the power produced by the facility. Bloomberg Business reports idled wind generation capacity in China, for lack of the grid's ability to accept the power produced by the facilities located in otherwise-promising sites based on available winds. The main advantage of wind power is the availability of free energy from moving air, without creating pollution from burning fuel. The main disadvantage is the unreliability of the winds; when the wind doesn't blow, the investment in turbines isn't paying off and the grid must work around an intermittent power supply. Systems not on the power grid need a storage device like a battery to hold generated power when there isn't enough wind. National Geographic reports on problems with turbines killing winged wildlife, and the difficulties in adopting new designs to fix the problems. Noise and even shadows from the turbines also cause problems. National Geographic: Will Newer Wind Turbines Mean Fewer Bird Deaths? Silbajoris, Alex. "How Is Wind Energy Produced?" Sciencing, https://sciencing.com/how-wind-energy-produced-4899867.html. 24 April 2017.